I went into an Asian market the other day (no, not the one that sells crickets) and I was looking at a cool piece of Korean cookware. It was basically a round, half-inch thick disc of granite about the same diameter as a frisbee that had two stainless steel handles embedded in the stone on either side. I imagine what you do with it is toss it over a fire, get it really hot, and then use it to cook those lovely marinated strips of short rib and other meats that the Koreans do so well. I wasn't positive that's how the device was used so I flipped it over for further inspection and that's when I discovered there were instructions on the back. "Ah, now we'll get to the bottom of this I thought!" But, well... take a look. I'm not totally sure that's going to be much help to anyone. Let's take a closer look. As I read and pondered, I noticed that the instructions were no longer adhering to the Marvelous Cookware of Serpentine Stone so I slipped them into my pocket. At first I felt kind of bad about stealing the instructions. 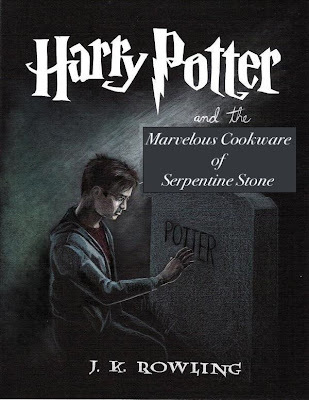 Would the eventual purchaser of the Marvelous Cookware of Serpentine Stone know how to use the thing? Would he or she understand that "the food must be attention to not get bumed. /only cooking roast)"? But then I realized that Marvelous Cookware of Serpentine Stone cooking is something you can't be taught. It's like parsletounge: You're either born knowing that "it' s principle to get used to it to be pot stewed," or you aren't. Sadly, I wasn't. But if any of you out there can offer any more information please add it in the comments section below.